Autonomous tractor concept unveiled exemplifies new tagline, “Rethink Productivity” Case IH announced “Rethink Productivity” as the new tagline for the brand to demonstrate a new focus on future innovations that help producers achieve High-Efficiency Farming practices. As a demonstration of this approach, the brand also unveiled a sleek, new autonomous tractor concept vehicle. 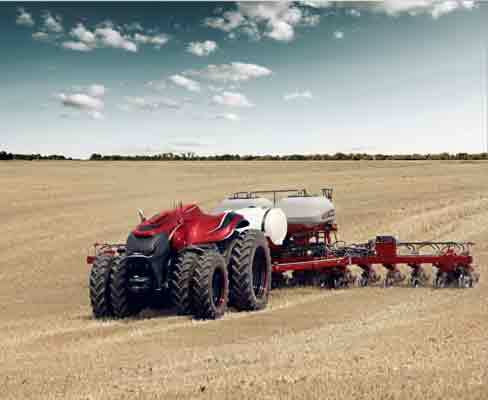 Although the autonomous concept vehicle was developed in the form of a cab-less tractor, Case IH executives explained that combines or other equipment would operate on the same technology. Case IH introduced “Rethink Productivity” as the brand’s new tagline on opening day of the 2016 Farm Progress Show. Case IH and CNH Industrial’s Innovation Group based the cab-less autonomous concept on an existing Case IH Magnum tractor with reimagined styling. The vehicle was built for a fully interactive interface to allow for remote monitoring of pre-programmed operations. The onboard system automatically accounts for implement widths and plots the most efficient paths depending on the terrain, obstructions and other machines in use in the same field. The remote operator can supervise and adjust pathways via a desktop computer or portable tablet interface. Through the use of radar, LiDAR (light imaging, detection, and ranging) and onboard video cameras, the vehicle can sense stationary or moving obstacles in its path and will stop on its own until the operator, notified by audio and visual alerts, assigns a new path. The vehicle will also stop immediately if GPS signal or position data is lost, or if the manual stop button is pushed. Machine tasks can also be modified in real time with remote interface or automatic weather warnings. “An autonomous tractor like this could seamlessly integrate into an existing farm machinery fleet, with minimal operational changes,” Bose said. “Multiple autonomous vehicles could be put to work in one field or separate fields, on the same tasks or consecutive ones. It could allow a person working with no employees to operate multiple tractors, or could complement very large operations that have challenges finding ample skilled workers.” CNH Industrial collaborated with its long-standing technology provider Autonomous Solutions Incorporated, ASI, a Utah-based company that is the industry leader in off-road autonomous solutions, in the development of this concept autonomous technology.